Paul and Marion Turgeon had visited the museum the week before, and Paul called my attention to an unusual folio from the Story of St. Jerome. 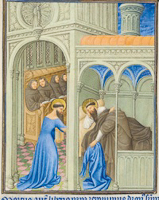 It seems that one night, while Jerome slept, a fellow monk substituted a woman's dress for Jerome's habit (right panel). When the bell called the monks to Matins, Jerome sleepily put on the dress and wandered into the chapel wearing it (left panel). The Limbourg brothers, who made the drawings, seemed to delight in stories near the edge of morality. 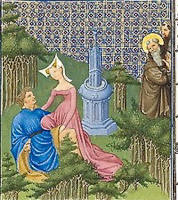 The Belles Heures, despite its status as a book of prayer, is filled with depictions of female saints with bared breasts, gory beheadings, even a young Christian man being sorely tempted by a pagan woman. I was led to wonder if these stories and images were chosen as instruments of moral edification or because of their slightly salacious character. As we left the exhibition, we wandered inadvertently into the Robert Lehman collection, an odd, but fascinating, collection of art housed in an elaborately decorated set of rooms "designed to evoke the ambience of Lehman's own house on West 54th Street in New York City." 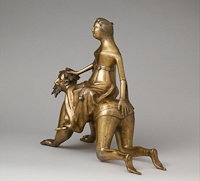 One object in particular caught my attention: a bronze statuette of an old man on his hands and knees being ridden, side-saddle, by a young woman - her right hand atop his head and the left conspicuously splayed across his backside. I was astonished to read its title: Aristotle and Phyllis. I have known Aristotle since college. I've read most - if not all - of his works. I've taught him in my courses on Ethics and Greek Philosophy. But I had never heard of Phyllis - much less a Phyllis with the nerve to put a philosopher of Aristotle's stature in such a compromising situation. 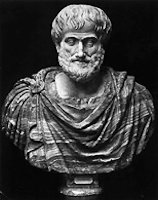 I knew that Aristotle had a lover with whom he had a son, Nicomachus - but her name was Herpyllis, not Phyllis. When we got home, a few minutes on the Internet led me to a fellow named Ayers Bagley, a professor emeritus at the University of Minnesota, who maintains a website called the Virtual Museum of Education Iconics. It contain a Gallery called Study and Love: Aristotle's Fall which includes two dozen images of Phyllis astride Aristotle: in tapestry, stained glass, ivory, metal, wood cut, marble, and plaster - in short in every medium available to the late medieval and renaissance artist. The story that inspired the images goes something like this: When he was tutoring Alexander the Great, Aristotle tried to discourage his charge from spending so much time with his girl friend, Phyllis. When Alexander reluctantly agreed, Phyllis devised a scheme to regain her lover. Early one morning, she slipped into the garden next to Aristotle's study, let down her hair, loosened her gown, and began to dance. Unable to resist her allures, the philosopher reached through the open window and tickled her under the chin. She promised to give him what he wanted if he did one thing for her: get down on all fours and let her ride him like a horse. He complied. Riding on his back, Phyllis sang loudly enough for Alexander to hear. When Alexander demanded an explanation, Aristotle replied that Alexander should learn a lesson from his behavior. If a wise old philosopher is unable to resist the power of love, how much more difficult it will be for a young man. Appropriately chagrined, Aristotle was forced to allow the young lovers to reunite. It is hard for me to imagine that this story has a basis in fact - that the philosopher who defined happiness as the virtuous activity of the soul, and virtue as a disposition to act in accord with right reason, could put himself in such a compromised position - and yet Aristotle's writings on incontinence in Book VII of the Nicomachean Ethics reveal a keen appreciation of the ability of passionate desire to eclipse rational understanding. But it is not to Aristotle's ethical works that we should look to interpret the phenomena of St. Jerome in drag and Aristote Chevauché, but to his work on poetry. In chapter XXIV of the Poetics, he discusses the element of 'the wonderful' in the arts, in the original sense of that which attracts attention by making us wonder, pointing back to its origin in the irrational. Artists, he suggests, should learn from Homer the 'art of telling lies skillfully', veiling the absurdity of their tales in a poetic charm that allows us to overlook their untruthfulness.